The last iteration of the Hunter 33, introduced in 2005, was a big hit for the Alachua, Florida company. Its balance of value, volume and performance struck a chord with sailors, and more than 600 were built. There’s always a certain risk in replacing a top-selling boat with an updated version—you might lose the indefinable quality that underpinned its appeal. But after sailing the new 33 on a windy January day on Florida’s Manatee River, I reckon Hunter has no cause to worry. This is one of those boats that just feels right for its purpose in life—to provide easy, enjoyable coastal sailing for a couple or small family. We headed out in a solid 20 knots of wind, gusting to 25 and more. With this in mind we left the jib rolled up and let out all of the in-mast furling mainsail, before setting off on a close reach. The 33 accelerated eagerly and was soon trucking along at close to 7 knots, light on the helm and feeling completely at home in the conditions. The new hull form, by longtime Hunter designer Glenn Henderson, has a long waterline, broad aft sections and a chine that runs a fair way forward before merging into the topsides. I’m guessing this accounts for some of the 33’s solid directional stability at large angles of heel; she shrugged off the puffs and stayed on course. I found steering was comfortable whether standing or seated, and appreciated being able to tend both the main and jib without leaving the wheel. The cockpit is well laid out and is bisected by a large solid drop-leaf table that provides a welcome brace point for crew. At the forward end, the coamings are high enough to let you lean back comfortably; a pair of seats aft are set into the sternrail, bracketing a large drop-down swim platform. There’s reasonable stowage in a pair of quarter lockers and an under-seat locker that can swallow fenders and docklines. Side decks are wide enough for easy passage forward. Long grabrails recessed into the cabintop provide additional security, and the molded antiskid felt grippy underfoot. 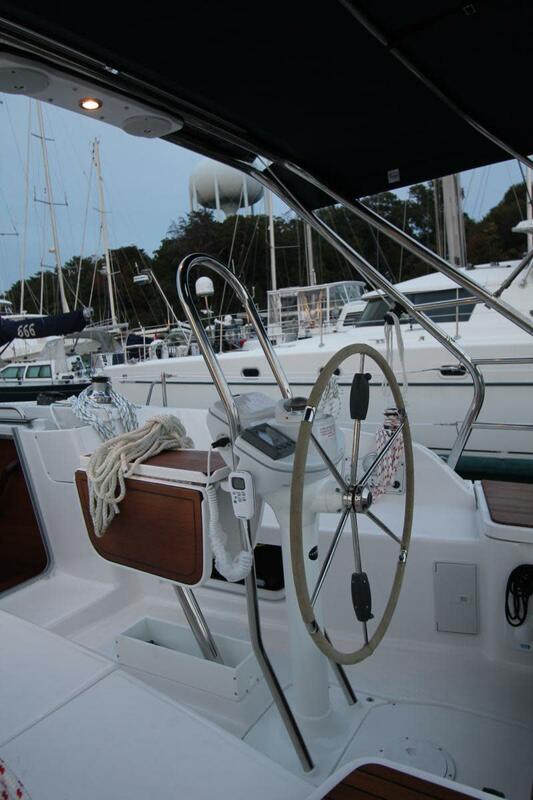 The foredeck is uncluttered and secure, and the single anchor roller fronts a wide but shallow chain locker. Belowdecks, the aft cabin features a large transverse berth, standing headroom and some well-arranged stowage. The forecabin, though brighter and better ventilated, has a smaller bunk. I think Hunter has done a great job in terms of styling, layout and finish quality. 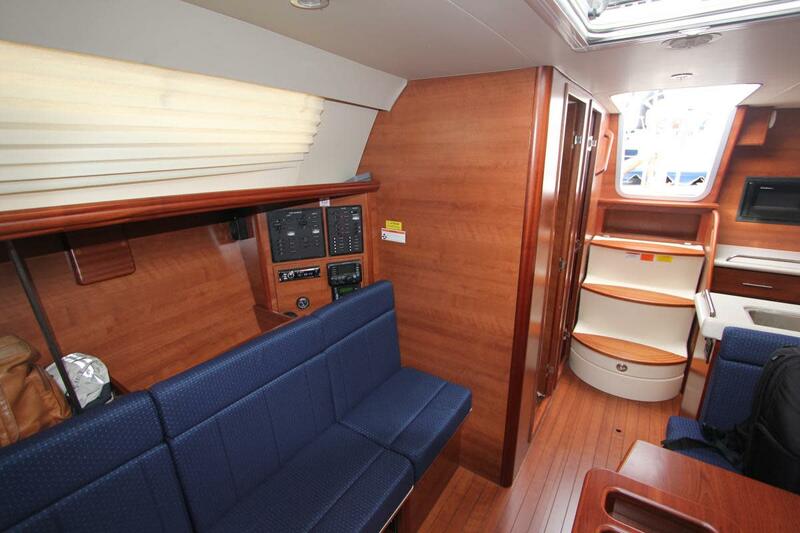 Teak trim and veneers oriented so the grain runs horizontally combine with plenty of ambient light via hatches and portlights to give a warm, welcoming feel; the cabin sole is a classy hardwood-lookalike laminate. There’s enough room for four to six people to relax around the drop-down atable, and the center section of the starboard settee converts to a nav table. The galley has plenty of worktop space, a large fridge and a microwave oven. Stowage is plenty adequate for weekend or longer cruises. I found the Hunter 33 a capable and perky cruiser, worth a long, hard look if you’re in the market for a boat of this size. The optional in-mast mainsail makes for easy handling, but if you’d like to sail faster and point higher go for the square-headed main and deeper keel. The sticker price is very reasonable, but will ratchet up quickly depending on how many boxes you check on the extensive options list.